I have no hotel in Lagos – Governor Yari – Royal Times of Nigeria. 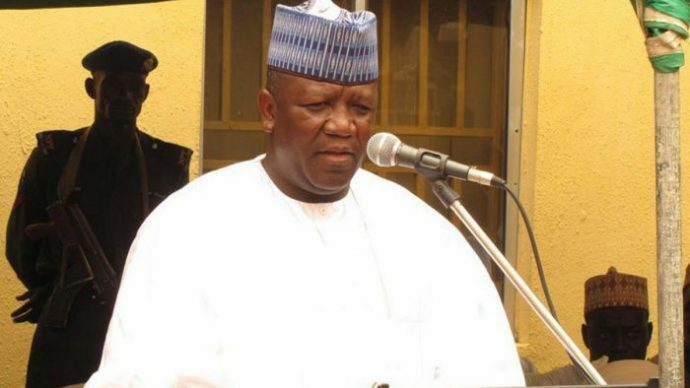 Zamfara State Governor, Abdulaziz Yari, has denied allegation that he has a hotel under construction worth $3 million, monies gathered from the Paris-London Club refunds. In a statement signed by Abulrazque Barkindo, head, public affairs, Nigeria Governors’ Forum Secretariat, Yari said he did not have a plot of land, much less a hotel. The statement read; “Reports on Governor Abdulaziz Yari Abubakar of Zamfara state, and chairman of the Nigeria Governors’ Forum making the rounds that the ‘governor is building a $3m hotel from monies stolen from the Paris-London Club refunds to states’ give cause for worry,”. “The reports contain harmful, damaging and libelous insinuations which remain largely unsubstantiated despite the fact that it attributes the leaks to the Economic and Financial Crimes Commission (EFCC), officials in Lagos. “Governor Abdulaziz Yari Abubakar has said emphatically that he does not even own a plot of land in Lagos not to talk of a hotel. “But the Economic and Financial Crimes Commission officials in Lagos claimed as follows: that “they have found a hotel being constructed by Governor Yari of Zamfara state with $3m he stole from London-Paris Club loan refund to Nigerian states. “That “apart from the $3million, Governor Yari also diverted N500 million from the Paris Club refund to pay off a loan”, an Economic and Financial Crimes Commission (EFCC) source revealed to an online medium. “The medium also added that EFCC officials in Lagos revealed that “overall the governor embezzled the sum of N2.2 billion from the N19billion set aside illegally to pay “consultants”, all of which are wrong, harmful, libellous and misleading disclosures. “The Economic and Financial Crimes Commission (EFCC) was quoted extensively as source of that report and the Nigeria Governors’ Forum is alarmed that the EFCC continues to feed the media fibs at the expense of its hard-earned reputation as the anti- graft agency that Nigerians used to respect,” the statement read. “The sources were courageous enough to mention a hotel in Lekki area of Lagos but gave neither a street name nor any specific information on the property to give credibility to the allegations. This does no service to any investigation nor does it help the development of our country Nigeria. “It is not, however, entitled to make unfair attacks, based on unfounded, false and unsubstantiated allegations against responsible public office holders. “The media should support the EFCC in ensuring that convicting people on the pages of newspapers shouldn’t be the focus of the EFCC in its war against corruption.